We know smoking is injurious to health. It causes severe injury to lungs and increases its vulnerability to different types of infections. One such smoking induced disorder is the major damage in air sacs in lungs, which makes patients suffer from abruptly shortage of breath. This problem is called emphysema and it is one of the diseases counted in Chronic Obstructive Pulmonary Disease group, shortly known as COPD. 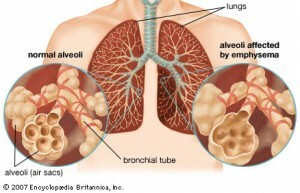 The symptoms of this lung disorder often remain non-acute, but chronic. People suffering from emphysema mostly suffer from respiratory discomfort, difficulty when exhaling, and recurring irritation due to cough and wheezing. Its symptoms are slowly progressive therefore often remain undetected at its first stage. Learning about its risk factors will help you to avoid its triggers and thus to ensure better protection from this lung disease. Cigarette smokers are at the great risk of developing emphysema; however, those who smoke pipe or cigar are not spared either. The intensity of the addiction and number of year under the addiction works as the trigger. Although all smokers are susceptible to this lung disease, people between 40 and 60 years are mostly found at high risk zone for developing the lung trouble. People who are regularly exposed to passive smoking may have developed this infection after a certain time. In this way kids may also be affected by this respiratory problem being induced by passive smoking around. Those are not typically smoking-addicted but are regularly exposed at fumes of cotton, mining products, grain or woods may develop the problem of emphysema. The risk gets doubled if anyone of these fume-exposed individuals is found smoking addicted. Regular and high-degree exposure to harmful pollutants like fumes of fuel, car emission, coal fumes, dust and grime may increase the risk of emphysema infection in an individual. Knowing the risk factors and maintaining rigorous avoidance of these risk factors is one of the prime methods to build natural resistance to emphysema. To avoid chronic respiratory diseases such as emphysema, asthma, COPD and others, using home salt therapy is a good start. The salt aerosol helps in strengthening the respiratory mucosa to allergens and help to clean the pollutants from the respiratory system. Maintaining a good hygiene on the respiratory tract is a priority today!